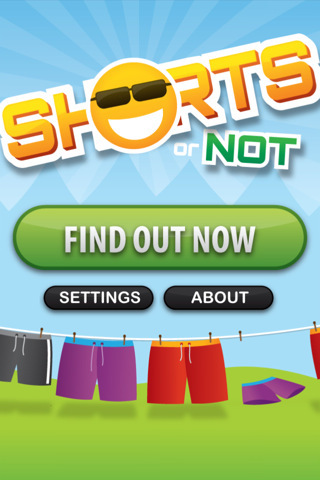 Developer Quote: "This great little app finds your local weather conditions to let you know if today is a 'shorts day'." All you need to do when you get up each morning (and let's pretend you really don't have to dress for work) is tap the Find Out Now button to see what the weather holds for you today! 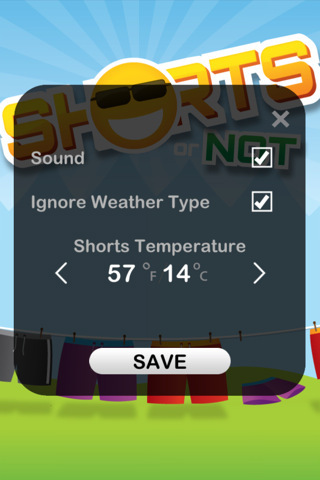 In my case, when the app automatically found my zip and the weather here, my report popped up as "No Shorts!" (This is because even though it is 82 degrees out, it is still partly cloudy). Your county/city and country will also be listed underneath the temperature. Just tap the X to close out your forecast box and return to the app. 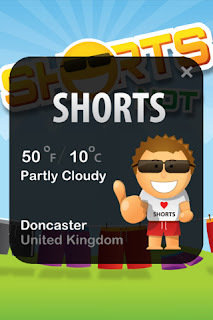 I later discovered that the weather conditions must be sunny in order for the caption to read "Shorts". You will then see the icon smiling and giving a thumbs up! Conversely, if it is not a nice day out (even though warm), you will see the little guy holding an umbrella and looking a bit glum with the caption, "No Shorts", as in my previous example. However, in the Settings you can tell the app to ignore the weather conditions and, therefore, only base the wise "shorts" decision on temperature. Adjust the temperature here also, according to what you feel comfortable with when wearing shorts. For me, it's 70 degrees! So go ahead and customize this daily app so that before your foot hits the ground, you know exactly what you will wear that day, and what sort of weather challenges you may face! No need to swelter in hot clothes on a sunny day any more. Be prepared with your iPhone and Shorts or Not. COOL CONCLUSION: "Shorts or Not is a simple but useful app that gives you a real temperature reading with a dose of humor to start your day off right!" --Developer Link: Albino Pixel Ltd.